Goethals Bridge slated to open May 19, 2018. 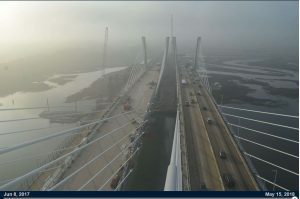 The long waited opening for the Goethals Bridge, connecting New Jersey to New York is slated for May 19, 2018. All sensors are commissioned and are streaming data as scheduled. Data streams from Sensr, Dimetix, Campbell Scientific and Vaisalla have been incorporated into the ‘Integra’ integration software by Civionic Engineering with the support of Mass Electric and Kapsch TrafficCom North America.